Special super concentrated product designed to perfect low-temperature properties of diesel fuel. It is used to improve the fluidity and pumpability of fuel at low temperatures. Efficiently decreases the freezing temperature of diesel fuel. Economical in use, a ratio 1:10 000. Prevents clots and paraffin crystals forming. Protects the filter from plugging when pumping cold fuel. Guarantees easy engine start at low temperatures. 1. Squeeze the content of the tube into a fuel tank (refueling nozzle). 2. Fill the car following the dosage instructions. 3. Run the car as usual. Up to -20 °С – 1 tube for 100 liters of summer diesel fuel. Up to -35 °С – 1 tube for 20 liters of summer diesel fuel. 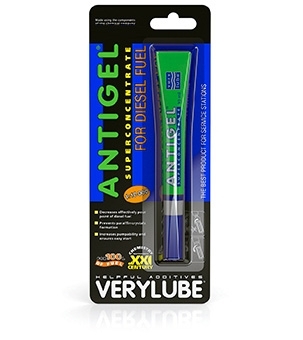 Antigel should be introduced into the non-thickened (transparent) summer diesel fuel. The substance should be warmed up to the temperature of 20. .. 25 °С before application.